Samsung has hit Apple with a 20% price hike on all A-series chips, according to an article in Korean newspaper Chosun Ilbo reported by Market Watch. 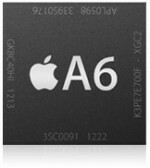 Samsung currently supplies the A6 processor that powers the iPhone 5, and the A6X chip in the 4th-gen iPad. The Korean electronic giant allegedly asked for a “significant price raise” for continuing to build and supply the chips to Apple according to a person familiar with negotiations between the two companies. Apple, who appear to have first disapproved of the significant increase, have had no choice but to accept the 20% price lift due to an inability to find a replacement supplier. Samsung currently has a contract to supply Apple with processors until 2014, with volume expected to reach 200 million units this year alone. Despite the long-term contract with Samsung, reports have suggested that Apple is “serious” about shifting processor production away from Samsung, their main competitor. Apple have allegedly been in talks with Taiwan Semiconductor Manufacturing Co (TSMC) to take over production of chips for the iPhone, iPad and iPod Touch as soon as end-2013.